All prices include equipment, initial instruction, and a three-hour ticket. Entry to the area is free of charge and paths beside the courses allow visitors to encourage climbing friends and family members, provided they exercise proper caution under and near all courses. 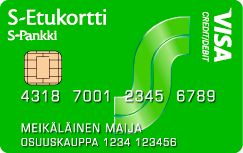 Membership discounts are available by showing an S-Etukortti card and to Holiday Club shareholders. For a discount, please show a valid shareholder card. On your birthday, you can come and adventure free by presenting an ID that includes a photo.